We had our induction scheduled for Thursday 8/24 due to my diagnosis of gestational hypertension. This was pretty tough for me to accept. I was induced with my first at 37 weeks for the same reason, his birthing was not easy or peaceful. I really wanted this birth to be the peaceful, drug free one I had envisioned. On Tuesday 8/22 I got adjusted and did acupuncture. I had done everything I could to convince my little man to come on his own. I made my peace with whatever direction this birthing would take and focused on my son. Wednesday morning 8/23 I woke up with pressure waves that definitely felt stronger than the ones I’d been feeling for a week. My husband woke up at 4:45 for his morning run, I assured him he could go as they were still 12-15 minutes apart. I started getting ready, ate some breakfast, packed my last minute things, etc. all while starting my birthing day playlist. Only an hour later my pressure waves were now coming every 4-5 minutes. When my husband got back at 6:15 my bags were by the door and I said shower quick, we need to go (hospital is 30 minutes from our house). This whole time I’d been listening to my birthing tracks. These definitely helped me stay focused on the drive. 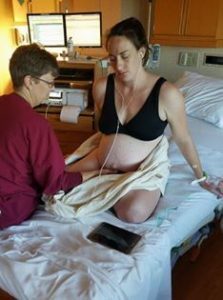 When we arrived at the hospital we were all surprised that I was 6-7cm open, 100% effaced and baby was at -1 station. Once in the birthing room I got in the tub which felt amazing. I got out because I was starting to feel a little pushy and they don’t let you birth in the tub. My midwife checked me again and I was at a 9 with just a soft lip left. My bag of waters ruptured while I was starting to push, it had meconium in it. I had my Bubble of Peace intact and I remember noting in my mind that there was meconium, but that I just needed to focus on my job of birthing my baby. 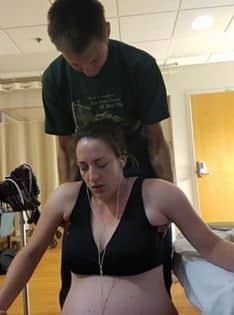 I’d started pushing on hands and knees, but baby’s heart rate didn’t like that position. We tried with me on my side, but that didn’t feel good so we flipped me on my back. I became aware that there was concern over baby’s well-being with his heart rate dropping, I kept hearing that we needed baby out. My midwife informed me that she brought in an OB in case we needed to get baby out fast. Again, my Bubble of Peace remained intact and that just fostered my focus on birthing my baby. I ended up purple pushing, but I was bound and determined that I was going to birth my baby. 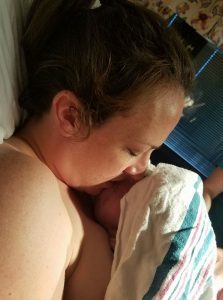 The feeling of pushing him out was the most amazing, empowering experience. Patrick Thomas was born OP at 12:07 pm on 8/23 (his guess date). 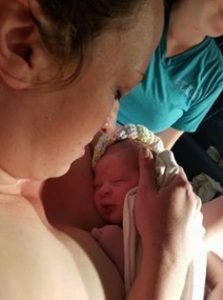 He weighed 8 lbs 11 oz and was 21 1/4″ long. I’m so happy my little man decided it was time for him to make his entrance!